Shop Floor Automation System – Detailed Case Study – TelePro, Inc. The Level 2 System consisted of a Dec Alpha System running an Oracle server. 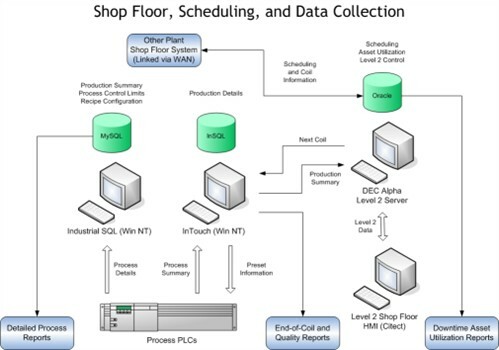 This system managed scheduling information, gathered asset utilization and downtime data, stored shop floor related data, sent next coil information to Level 1 and received production summary data from Level 1. The shop floor HMI was implemented with Citect for Windows (CI Technologies Pty. Ltd.) screens on PCs running in Windows Server. Screens included scheduling lot operation, coil location tracking, scrap data entry, etc. A WonderWare InTouch System did process pre-set and quality tracking. Coil scheduling and general process set information was sent to the InTouch System from the Level 2 Alpha. The InTouch System communicated directly with the process PLCs registered to configure pre-set values, as well as gather process quality data during the coil run. After the coil was completed, the InTouch System stored the process summary data to an MS SQL server and sent the data back to Level 2. Detailed production information was gathered with a WonderWare Industrial SQL System. Process control engineers can later analyze this data. The systems TelePro put in place are an integral part of this site's manufacturing process. We have met of the main goals for this project, which is to design a system that requires little or no ongoing support and maintenance.